In 2008, J.K. Rowling delivered a deeply affecting commencement speech at Harvard University. 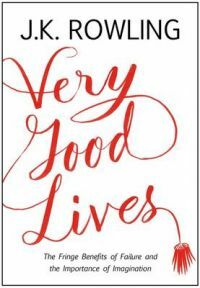 Now published for the first time in book form, VERY GOOD LIVES presents J.K. Rowling's words of wisdom for anyone at a turning point in life. How can we embrace failure? And how can we use our imagination to better both ourselves and others? Drawing from stories of her own post-graduate years, the world famous author addresses some of life's most important questions with acuity and emotional force. J.K. Rowling is the author of the bestselling Harry Potter series of seven books, published between 1997 and 2007, which have sold over 450 million copies worldwide, are distributed in more than 200 territories, have been translated into 73 languages, and have been turned into eight blockbuster films. As well as an Order of the British Empire for services to children's literature, J.K. Rowling is the recipient of numerous awards and honorary degrees, including the Prince of Asturias Award for Concord, France's Légion d'honneur, and the Hans Christian Andersen Award, and she has been a commencement speaker at Harvard University. She supports a wide range of causes and is the founder of Lumos, which works to transform the lives of disadvantaged children. J.K. Rowling is the author of the bestselling Harry Potter series of seven books published between 1997 and 2007 which have sold over 450 million copies worldwide are distributed in more than 200 territories translated into 73 languages and have been turned into eight blockbuster films. She has also written two small volumes which appear as the titles of Harry's schoolbooks within the novels. Fantastic Beasts and Where to Find Them and Quidditch Through the Ages were published by Bloomsbury Children's Books in March 2001 in aid of Comic Relief. In December 2008 The Tales of Beedle the Bard was published in aid of the Children's High Level Group and quickly became the fastest selling book of the year.